Tubridy celebrates scoring against Armagh last year. STALEMATE IN NEWRY as Clare and Armagh shared the spoils in a dramatic Allianz Division Two tie. Deep into additional time David Tubridy incredibly landed 1-1 in a bizarre sequence of two sideline balls to rescue a point for the Banner men. Despite Jamie Clarke being sent off in the first half for Armagh, Kieran McGeeney’s side still battled back into prime position for the full two points. Taking the lead at the end of the second half with four points in succession from Rory Grugan (free), Greg McCabe, Joe McIlroy and Jemar Hall, the Orchard men game let the game slip between their fingers to draw for the second time this season. A serious leg injury to Clare wing forward Dermot Coughlan in the opening play put a dampener on the game from the outset. Both sets of players were forced to re-warm up such was the delay. Rian O’Neill started brightly for Armagh, the Crossmaglen forward notched a brace as shell shocked Clare struggled with the set back. Both sides, to be fair, suffered with the conditions. The slippy underfoot conditions led to a slew of misses and continuous handling errors. Clare were constantly under pressure; Kieran Malone from play and Tubridy opened their account as they opened the relief valve. Clarke then received a straight red card, swinging an elbow back at this marker but McGeeney’s charges did responded positively. 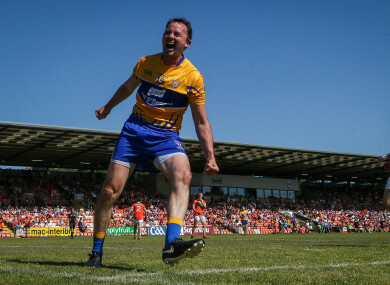 Greg McCabe found the net after a late run through the Clare rearguard and fellow half-back Connaire Mackin quickly added a point. Once the initial urgency wore off, the numerically disadvantaged Armagh suffered as Clare grew in control and reeled off 1-3 to no reply to make it 1-8 to 1-6 at half time. Gavin Cooney, Coughlan’s replacement, had a fisted effort for a point deflect over Blaine Hughes head into the net. Tubridy was on hand to fire over two frees and one from play either side of the major to give Clare an unexpected lead. Armagh then struck three points to no reply after the break themselves. Grimley gave them the lead after O’Neill and Charlie Vernon broke up the field to score. Tubridy levelled the game and Clare midfielder Cathal O’Connor was soon dismissed and with equal playing numbers, Armagh powered on to lead by four and looked to take two points home from their ‘adopted home’, only for Tubridy to claw them back with some sideline brilliance under the stand. Scorers for Armagh: Greg McCabe 1-1, Niall Grimley 0-3 (0-2f) Rian O’Neill 0-3 (0-1m) Jemar Hall 0-2, Connaire Mackin Rory Grugan (1f), Joe McElroy and Charlie Vernon 0-1 each. Scorers for Clare: David Tubridy 1-7 (0-2f, 1-1sl 0-1m), OG 1-0, Dale Masterson, Kieran Malone and Gordon Kelly 0-1 each. 13. Stefan Campbell (Clan na Gael). 21 Ross McQuillian (Cullyhanna) for Hall (69). 23. Cormac Murray (St Joseph’s Miltown) for Sexton (69). Email “Tubridy brilliance from the sideline helps Clare to dramatic late draw against Armagh”. Feedback on “Tubridy brilliance from the sideline helps Clare to dramatic late draw against Armagh”.